Christmas is almost here and everybody is so generous and busy giving away tags and awards. 'Tis the season for giving and sharing indeed! And the blogger in me is just so delighted and happy to be thought of by my great blogger friends! 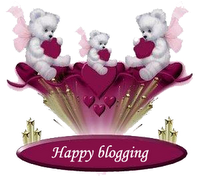 And I thank my Baby Sam for the honor of giving me the Happy Blogging Award. I am passing this award on to all my friends in the blogging world for always being happy persons and for writing inspiring stories for the whole world to see! Congrats, this is a really cute award!